The awesomely retro Smeg Mini Fridge gives you extra refrigeration in your home in a gorgeous cream gloss finish. 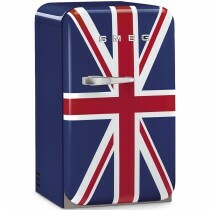 This product features a right-hinged door. Keep your drinks chilled Perfect for parties or as a backup appliance, the Mini Fridge gives you 130 litres of chilled storage space for drinks or other conveniences. There's a handy chrome wine rack plus bottle and can separators for more flexible storage. 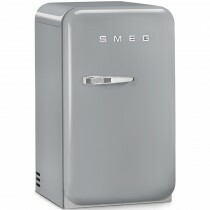 Two extra door compartments are useful for products you wish to access quickly and keep chilled to perfection. 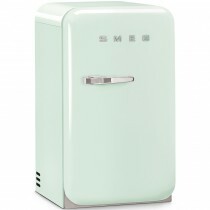 Energy and time efficient With an outstanding energy efficiency rating of A+, the 50's Retro Mini Fridge will ensure your electricity bills stay low. 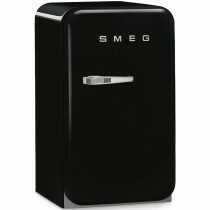 The automatic defrost feature of this fridge automatically defrosts regularly, saving you time and the need to defrost manually. An outstanding quiet operating noise of 37 dB(A) means the is the perfect addition to any room and will not create any disturbances. 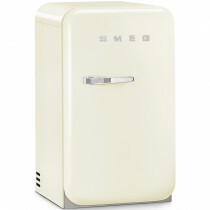 With great 50's style retro design you won't want to hide away the Smeg Mini Fridge is a fun piece to keep your favorite tipples chilled.